The tracker is working great, the two issues of a nick on the inside of one of the chambers and occasional stickyness when shooting double action have been resolved. I used a dremel tool to take the nick out of the chamber and then some polishing compound to ensure it was smooth. The double action stickyness really was confusing, and i finally decided to open her up. This requires removing the ribber grip and the 3 screws in the side. Be really really careful doing this, it voids the warranty if you make a mistake, and depending on if you break or loose anything inside, you have to send it to Taurus at your cost (for both shipping and repair). So don't screw it up! The inside of the action had a really weird grease and gun oil on it, and you could see where it was "hanging up" in the action. I didn't take pictures. I didn't want to remove the internals, so I just sprayed it down really good with a gun scrubber high pressure spray, which I think is just carberater cleaner. Then I blew it dry with compressed air (being careful not to mess anything up), re-applied some CLS gun oil and then tested. The action is 100 times smoother. The parts could probably still require some polishing and I'd love to put a lighter spring in their, but I will wait on these to see how well this holds up. 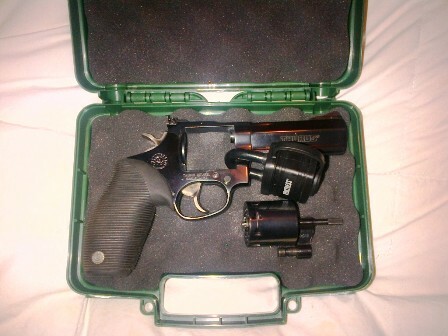 It cleans up nice and fits perfectly in the little case (as of course there is no way to put a lock on the gun and have it fit in the original packaging).